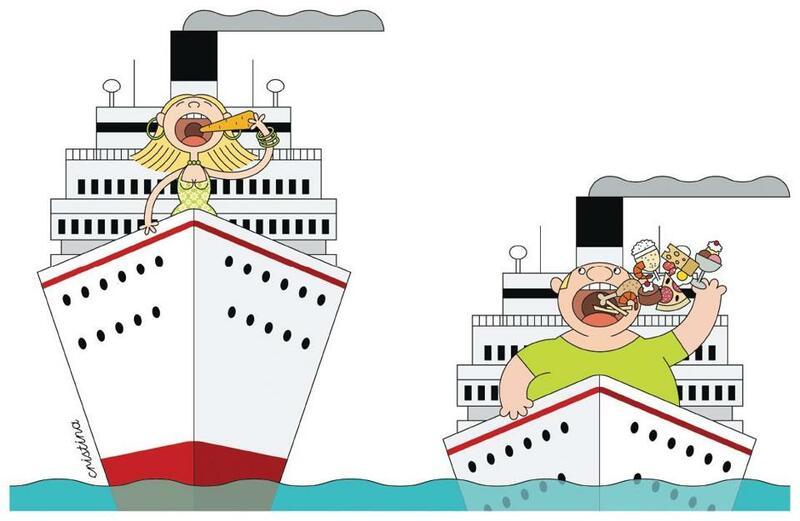 There’s an old saying in the cruise industry: The average weight gain on a ship is one pound per day. It’s easy to see why: Cruises offer oceans of opportunities to eat, eat, eat — with belt-loosening breakfasts, lard-laden lunches, and calorie-cascading dinners, along with snacks of pizza, ice cream, coffee drinks, cookies, and everything else on the fattening food chain. Some passengers, who want to assure they get their money’s worth, will actually eat a couple of breakfasts and lunches in one day, along with dinner and a midnight buffet. So, how to maintain your playing weight on a cruise? BRING YOUR OWN Yes, cruise ships offer an abundance of food, usually loaded with calories. But if you want to indulge without the bulge, bring some of your own healthy snacks. BRING A FAVORITE SPECIAL RECIPE Perhaps you have a favorite low-calorie item from the Hungry Girl website? Or you just love Grandma’s tomato sauce? Or want a veggie burger? Bring the recipe onboard, because cruise lines are all-too-happy to make you happy. ORDER HEALTHY DINNERS Many cruise lines offer lowfat items on the menu. But if nothing on the menu floats your boat, just order grilled chicken or shrimp, a butter-free vegetable, and a baked potato, and a bowl of fresh berries for dessert. You can also bring your own packets of fat-free salad dressing. I order my packets through www.minimus.biz. I also bring flavored water packets, so I’m not tempted by fattening umbrella drinks. DO WHAT VETERAN CRUISE EXPERTS DO Mary Jean Tully is the owner of the Cruise Professionals (www.cruiseprofessionals.com), an award-winning cruise travel agency, and she takes dozens of cruises every year. What does this veteran cruiser do to stay thin? She said she has the waiters leave the bread off the table so she obviates temptation and usually orders the spa cuisine. Next, she pre-books sessions with a personal trainer on the ship, so that she’s committed to working out — and can’t back out. WALK THE DECKS Even if you hate to exercise, it’s fun to walk the upper decks of a cruise ship to show your body who’s boss. Reward yourself with a massage in the spa. Also, skip the elevators and always take the stairs. SAVE THE BEST FOR LAST The cruise will seem even more special if you indulge just once in a favorite entree, cocktail, or dessert. I usually save my indulgence for the last day of the trip, or the second-to-last day. The upshot? I get to return home without any guilt — and without having to go on a diet. Debbi K. Kickham can be reached at debbikkickham@hotmail.com.